Any tax compliance system requires that tax is collected timely from the tax payers. Thereby the Government ensures that it has proper mechanism for recovery of taxes and in case of any delay, proper recovery in the form of interest is provided in the law. In GST,the net tax liability is computed after set off of input credit available with output tax liability. This net tax liability is then paid and return is filedin form GSTR-3B. However, many a times due to non-payment of the tax liability,return could not be filed within the stipulated time.Asper Sec. 50(1) of CGST Act, 2017 an interest @18% per annum is payable in case of delayed payment of taxes. In this article, we would study what constitutes this delayed payment of taxes. Is it the net tax liability after adjustment of input tax credit or the Gross tax liability before set off of input credit available in the Electronic credit ledger. This issue has also been a contentious one from the very beginning but the recent standing order No: 01/2019 dated 04.02.2019 passed by HYDERABAD GST COMMISSIONERATE has stirred up a hornet’s nest and is giving sleepless nights to taxpayers. An attempt will also be made to understand the In Principle approval given for Amendment of section 50 of the CGST Act during 31st Meeting of the GST Council December 22, 2018. 49. (1) Every deposit made towards tax, interest, penalty, fee or any other amount by aperson by internet banking or by using credit or debit cards or National Electronic FundTransfer or Real Time Gross Settlement or by such other mode and subject to such conditionsand restrictions as may be prescribed, shall be credited to the electronic cash ledger of suchperson to be maintained in such manner as may be prescribed. (2) The input tax credit as self-assessed in the return of a registered person shall becredited to his electronic credit ledger, in accordance with section 41, to be maintained insuch manner as may be prescribed. 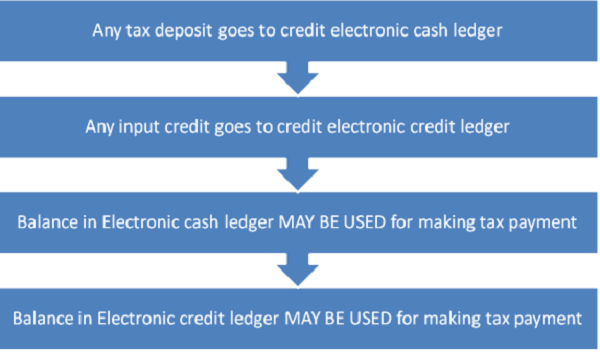 (3) The amount available in the electronic cash ledger may be used for making anypayment towards tax, interest, penalty, fees or any other amount payable under the provisionsof this Act or the rules made thereunder in such manner and subject to such conditions andwithin such time as may be prescribed. (4) The amount available in the electronic credit ledger may be used for making anypayment towards output tax under this Act or under the Integrated Goods and Services Tax Act in such manner and subject to such conditions and within such time as may be prescribed. Thus payment of output tax liability can be made by utilising the balance of input tax credit available in the credit ledger and further by utilising balance in the Cash ledger. In other words, unless the output tax liability is set-off with the balance lying in the Electronic Cash and or credit ledger,it will not be considered as taxes paid. Further, GST return system has been designed in such a way that the output tax liability is to be discharged in full by debit to the Electronic Credit and/or Cash ledger accounts and it does not allow partial discharge through the amount of input credit lying in the Electronic Credit ledger. (B) Standing order No: 01/2019 dated 04.02.2019 passedby Hyderabad GST Commissionerate. In a recent development, Hyderabad GST Commissionerate vide its Standing Order no. 01/2019 has instructed the departmental staff to conduct due verification of all the cases of belated filing of returns which obviouslyinvolve payment of the self-assessed tax after the prescribed due date and ensure that theinterest liability is paid not only on the cash component, but also on the input credit componentof the tax paid. The said order states that Input tax credit balance in the ‘Electronic Credit Ledger’ cannot be treated as the tax paid unless it is debited in the said credit ledger while filing the return for off-setting the amountin the liability Ledger. The interest liability under Sec. 50 is mandatorily attracted on the entire tax remaining unpaid beyond the due date prescribed. The ITC in balance as on the due date for filing the return has no relevance with regard to the interest liability u/s 50. It is immaterial whether the self-assessed tax is paid through the Credit/ITC or the Cash. Once the payment is beyond the prescribed date, interest liability is attracted on the entire Tax amount. The standing order emphasizes that interest under sec. 50 envisages that such interest is liable to be paid by the Taxpayer himself.Therefore, it is important to check the fact whether such tax payers paid the interest in terms of the Sec. 50 or not; and whether suchinterest was correctly paid on the entire self-assessed tax amount or they paid the interest only onthe cash component of such tax paid, but not on the ITC availablein their Electronic Credit Ledger. These provisions do not go well with the taxpayers point of view. Most of the taxpayers sincerely believe that interest u/s 50 is payable only on the net tax liability which is arrived after adjustment of the input tax credit available in their electronic credit ledger. This makes sense because input tax credit is the tax which a tax payer has already paid to the supplier of goods/services. This amount is paid to the government by the registered person who has collected it and in case of delay, he is liable to interest. The provision of not allowing set off of the same for the purpose of charging interest u/s 50 of the CGST Act in case of delay in filing return clearly tantamount to charging interest on the amount which you have already deposited. It’s like paying interest on the loan which you have already paid off. Moreover sometimes delay may be on account of technical glitches on the GSTN site which has become a normal practice. But, with the recent order of the Hyderabad Commissionerate, cat is out of the bag and if other Commissionerates’ also issue such an order or the assessing authorities start sending notices for recovery of tax on this basis,then it is bound to create a real problem for the taxpayers at large. 2. Amendment of section 50 of the CGST Act to provide that interest should be charged only on the net tax liability of the taxpayer, after taking into account the admissible input tax credit, i.e. interest would be leviable only on the amount payable through the electronic cash ledger. But this being In principle approval only and the said amendment u/s 50 of the CGST Act is still pending as no notification has been issued in this regard. So, how long this remains pending is an important question. Till then fingers should be kept crossed. DISCLAIMER: The views expressed in this article are strictly of the author. The contents of this article are solely for informational purpose. It does not constitute professional advice or recommendation by the author. The author does not accept any liabilities for any loss or damage of any kind arising out of any information in this article nor for any actions taken in reliance there upon. GST council in the 31st council meeting dated 22 Dec 18 has given inprinciple approval for amending Section 50 whereby interest will be charged only on net tax liability. It is a matter of time, this standing instruction will loose its significance.